Easter Island – Under the influence! Rapa Nui is better known as Easter Island and is one of the most isolated populated places in the world. Situated in the south eastern Pacific Ocean around 4,000 kilometres from Chile, South America its nearest inhabited neighbour is Pitcairn Island 2,075 to the west. There in the extreme isolation of the vast Pacific Ocean a unique and amazing civilization evolved that created the most wonderful giant statues and left behind a fascinating and mysterious legacy. Today the inhabitants of the island are known as the Rapanui. According to legend the original settlers named the island Te Pito Te Henua which translates as Navel of the World. Rapa Nui mythology tells how the first settlers arrived on the island and later how the island was divided to be ruled by different clans whose chiefs were descended from a legendary chieftain called Hotu Matu’a. The location of Hiva is not known for certain but it is thought likely that it was somewhere in the Marquesas Islands, some 3,200 km way, or the Gambier Islands, 2,600 km distant. It was shown in 1999, that it was possible to sail from Mangareva, in the Gambier Islands to Rapa Nui, using traditional Polynesian sea vessels in 19 days. According to oral tradition Hotu Matu’a lived in a place called Marae Renga, which may have been an island in the region of Hiva, or a land location. According to some versions, Hiva was found in the Marquesas Islands but sunk beneath the sea after a natural disaster, possibly a volcanic eruption. It could have been this that drove Hotu Matu’a into making the arduous journey to Rapa Nui and pioneer a new life for his family and his people. Other oral traditions say that it was internal conflicts that drove him to seek a new way of life. According to most versions of the legend of how the people came to Rapa Nui it was a priest called Hau-Maka who had a dream which he then told to Hotua Matu’a. In that dream Hau-Maka had flown out over the sea and discovered an island called Te Pito ‘o te Kāinga’, which means ‘the centre of the earth’ He then appeared to Hotu Matu’a in a dream to tell him this news. Hotu Matu’a believed the dream was his destiny and that of his people, so he sent out seven scouts in canoes to find this place. When they found it they ate and rested and planted crops of yams, and other plants on the new island so that when they returned with their King and people they would have something ready to eat. Oral tradition states that Hotu Matu’a and his people landed at Anakena beach in double hulled canoes similar to what Polynesians use to this day. From there they colonised the rest of the island which eventually was to be divided between his sons who went on to head their own clans. Rapa Nui mythology tells that once two different ethnic groups lived together on the island. One group or tribe of people was called the hanau eepe. This term has been mistranslated as meaning ‘long-ears’ when it actually means ‘stout’ or ‘stocky.’ However one of the traits of the hanau eepe was that they inserted pebbles into their ear lobes causing them to elongate overtime. The other group was the hanau momoko. They did not practise ear elongation and kept their ears short, mistakenly becoming known as the ‘short-ears,’ when the term really means slender or thin. Some experts think that the hanau eepe may have had higher status and were better fed than the hanau momoko who they thought were the workers or lower classes of their society. Other experts argue that the hanau epee came from South America and were an entirely different ethnic group from the hanau momoko who were of Polynesian origin and there is no agreed consensus among by the experts on this at the moment, other than to disagree with each other. In some versions of the mythology the hanau epee arrived after the people of Hotu Matu’a and tried to enslave them. It was the hanau eepe who brought the stone-carving skills to Rapa Nui. In other versions the hanau eepe were already on the island when Hot Matu’a arrived. In yet other versions they came with Hotu Matu’a and had been defeated by him in a conflict in Hiva and he had brought them with him to work the land. Whatever the case, conflict again erupted between the two people resulting with the slaughter of all but one of the hanau eepe. His life was spared and he was said to have took a wife and had many descendants. 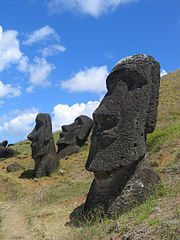 In 1722, the Dutch explorer, Jacob Roggeveen in 1722 gave the island its European name of Easter Island because he discovered it on Easter Day. In his accounts of his encounters with the islanders he records that there are two distinct ethnic groups. One group easily recognised as of Polynesian origin and the other group of white appearance with elongated earlobes, some to such an extent that they could be tied behind necks. He also records that some of the islanders were of large stature and this was also noted by Spanish explorers in 1770 who measured some of the inhabitants to be 196-199 cm tall. There are arguments among the experts as to the origins of the Rapa Nui people. Some theories give Polynesia as their origins whereas others, notably by Thor Heyerdahl, the Norwegian ethnographer, who argued for South America. He cited the similarity of some of the stonework found on the island to that found in South America and also the cultivation of sweet potatoes and other plants that originated in South America. This raises the question of how the sweet potato came to Rapa Nui and other Polynesian islands suggesting some contact between Polynesians and South Americans. Whether this was one-way or two-way cannot be determined but the possibilities exist. Sweet potatoes originate in South America but are found on Rapa Nui as well as other Polynesian islands. There are theories that they were washed off the South American landmass by heavy storms and floated to the islands where they took root, grew and were eventually cultivated by Polynesians. There are also those see this as evidence of contact between South America and Polynesian cultures. They argue that either South Americans reached Polynesian islands, possible drifting on rafts of balsa wood and driven by currents to Polynesian islands. Once there they either lacked the knowledge or capacity to return against the currents, or did indeed manage a return trip taking back with them parts of Polynesian culture. Or Polynesians did arrive in the Americas and with their better navigational and boat building skills were equipped to make return journeys bringing back parts of American culture with them. The Mapuche Indians of southern and central Chile appear to have possible connections with Polynesians. Situated 390 km east-northeast of Easter Island and 3,210 km west of Chile is Isla Salas y Gomez. In the language of Rapa Nui it is known as Motu Motiro Hiva or Manu Motu Motiro Hiva, which means ‘Bird’s islet on the way to a far away land.’ From Rapa Nui it points the way to mainland South America. Hive was the legendary land from which Hotu Matu’a is said to have originated and the similarity in name stand out, but there are also several other Polynesian islands part named ‘Hiva’ means ‘far away land,’ especially in the Marquesas Islands so it is difficult to draw conclusions. With the great movement of the Polynesian people from island to island it may be a name for a previous island home, though there are those who argue that it points to South America as their original home. Either way it is inconclusive. The island was certainly known to the Rapa Nui and it is believed they used to visit at regular intervals to harvest eggs from the great colonies of sea birds that use the island for breeding and nesting. The island is surrounded by steep cliffs and rocks and Rapa Nui tradition says that it was made this way by MakeMake to protect the sea-birds. In its isolation over the centuries its people evolved a unique culture whose most visual manifestation is the huge stone statues called moai, that are found all around the island. Little is really known of their purpose or how they were made and moved into position by people who had only Stone-Age tools and implements at their disposal. They are believed to have been representations of some of their most important forefathers and were part of a system of ancestor worship. Care needs to be taken with the word ‘worship’ as it does not necessarily mean the moai were revered as gods, or were deified. In many forms of ancestor worship there was a symbiotic relationship between the realm of the living and the realm of the dead. It was the task of the living to provide for the needs of the dead in the afterlife in the form of offerings. In return the dead looked after the needs of the living ensuring, health, good fortune and fertility of land to grow food. Most of the Moai were situated with their backs to the spirit kingdom of the sea looking inland to the realm of the living looking over the villages where the people lived. In Rapa Nui mythology MakeMake, or sometimes written as Makemake, or Make-Make was the creator of humanity, god of fertility and god of the ‘Tangata manu’ or bird-man cult. He was frequently depicted in petroglyphs found on Rapa Nui. Along with MakeMake there were three other gods associated with the bird-man cult. They were Hawa-tuu-take-take who was the ‘Chief of the eggs’ his wife Vie Hoa and Vie Kanatea. Despite all the effort put into the creation and situating of the Moai the culture was abandoned and most of the statues pulled down. There seems to have been some kind of civil war which swept aside the cult of ancestor worship to replace it with what is known as the cult of the bird-man, though Make-Make was still retained as the chief god of the cult. The cause of the conflict is believed to have been over the diminishing natural resources of the island. The bird-man cult existed, though with lesser importance during the era of the ancestor worship. In essence the bird-man cult appears to have centred on an annual ritualistic competition which decided which clan would win the rights to harvest the island’s birds and their eggs and also who would be Tangata-Manu or bird-man for the year. The contestants were the prophets of the clans, known as ivi-attuas, who would appoint an individual known as Hopu, who had been revealed to them in dreams to represent them and their clan by competing in the race to bring back the first egg. Just off Rapa Nui there lies a small islet called Motu Nui that was home to a colony of Sooty terns. Starting from the sacred cliff-top village of Orongo, the hopu would have to climb down the cliffs to the sea, swim across dangerous shark infested waters to reach Motu Nui, and then scale the cliffs there to find the first egg and return it unbroken to again swimming the seas and climbing the cliffs to Orongo. The task was arduous and dangerous and some competitors were killed in the process. The ivi-attuas would await the return of the hopu in Orongo. The hopu who found the first egg was allowed to rest on Motu Nui until he was physically and spiritually ready to carry the egg safetly back to Orongo. The other hopu returned to Orongo with news of the winner to their waiting patrons. The winning patron shaved his head and painted it either red, or white. When the winning hopu returned bearing the egg he would hand it to his patron who would then be declared Tangata-Manu. With the egg in his hand he would lead a procession from Orongo to the place where he would spend a five month residence. This would be Anakena if he was a member of the western clans or Rano Raraku if he was from a clan from the east of the island. When he arrived at his place of residence he became ‘tapu’, or sacred for the next five months of the year long term and grew his fingernails without cutting them for the term and wore a headdress made of human hair and received a new name. He was allowed special privileges as well as gifts of food and tributes. His clan was awarded the sole rights to harvest the birds and their eggs from Motu Nui for that season. He would then spend the rest of his term in seclusion in a special ceremonial residence. After the arrival of Catholic missionaries in the 1860s the cult was suppressed and subsequently went into decline. Unfortunately the Rapanui were to suffer devastating raids by slave traders which decimated their population and contact with Europeans brought smallpox and other diseases which nearly wiped them out completely. In this way many of their leaders and wise men perished and with then went most of the knowledge of the past. But the Rapanui people are resourceful and resilient and their population has increased again to more healthy levels. We will probably never know the secrets of their past or of their origins and the answers to the mysteries of Rapa Nui. Nevertheless, lets us celebrate the past of this truly wonderful island and its people while congratulating them on their present achievements and wish them the best – the very best, for the future.